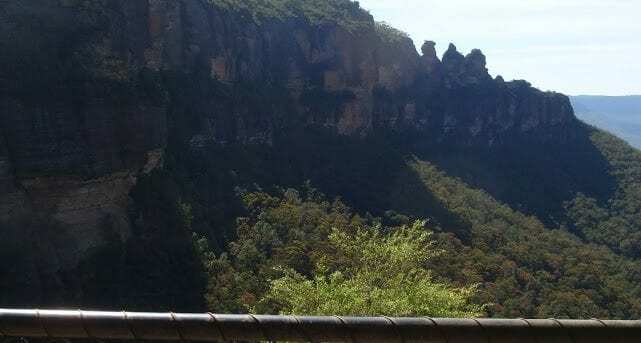 Scenic Railway to Ruined Castle is a 12.4km, grade 4 Return hike located in Blue Mountains National Park New South Wales. The hike should take approximately 7 hrs 30 mins to complete. This is a very popular full day walk in the Katoomba Area offering great views of the valley. The walk follows the edge of the cliffs through the undergrowth from the Scenic Railway to the Ruined Castle. There are great views to enjoy from the Ruined Castle. Arrive back in time to catch the Scenic Railway back up or be prepared for the walk up Furber Steps an alternate exit. Download maps and tracknotes for Scenic Railway to Ruined Castle hiking track from wildwalks.com.